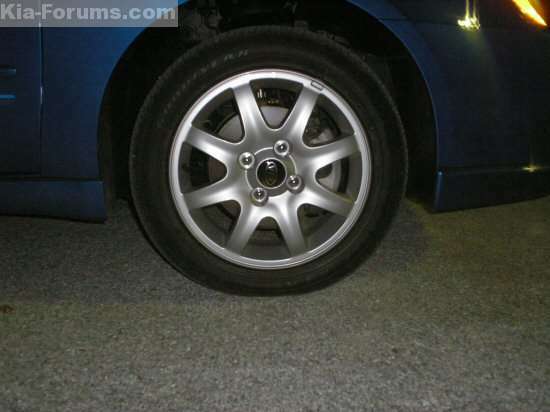 Kia Forum > Technical > Suspension, Wheels and Tires > What Size Rims Do You Currently Have On Your Ride? View Poll Results: What size rims do you currently have your ride? Just curious as to what size most of you have your ride. Im running 16&#39;s on my Spectra. I might just keep them on there for a while. They are a decent lookin wheel considering they are OEM. For tires I am running 205/50/16 Goodyears. The car handles great. Here is a pic of what the wheels look like. 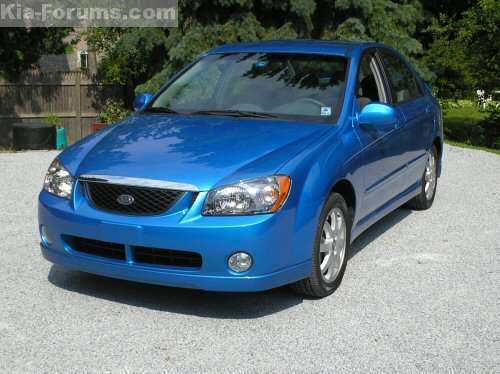 As for the Optima.......I am going to prolly put 16&#39;s on it someday. Buying the Spectra kinda put the modding of the Opitma on hold for a while. Not sure what kind of wheel Im going to get for it. NICE&#33; heh.. great pic.. The wife and I have been seeing plenty of Spectras on the road around our new apartments.. we like the looks.. we might look into that car once we can afford another car. Yeah the Spectra will make a good go car. Its easier to find performance mods for it compared to the Optima. I like having a Spectra and Optima. If I want to drive some thing sporty I will drive the Spectra and if I want to drive some thing luxury I will drive the Opitma. I see that you&#39;ve already started to doing some simple mods on your spectra.. good job&#33; For me, I&#39;m going to keep the car pretty OEM. Just work on the engine when I can/get a chance. I&#39;m now thinking about getting a K&N Cone Filter instead of a regular OEM fit replacement. What do you think? I would go with either a K&N drop in or a K&N cone filter. Kinda hard to decide there. I wouldnt go with a OEM filter. But yeah, I&#39;m really thinking about getting a CAI since it&#39;s not that much more expensive than just a regular K&N filter. Might as well.. right? Since the cone is not much more than the K&N drop in go for the cone filter.